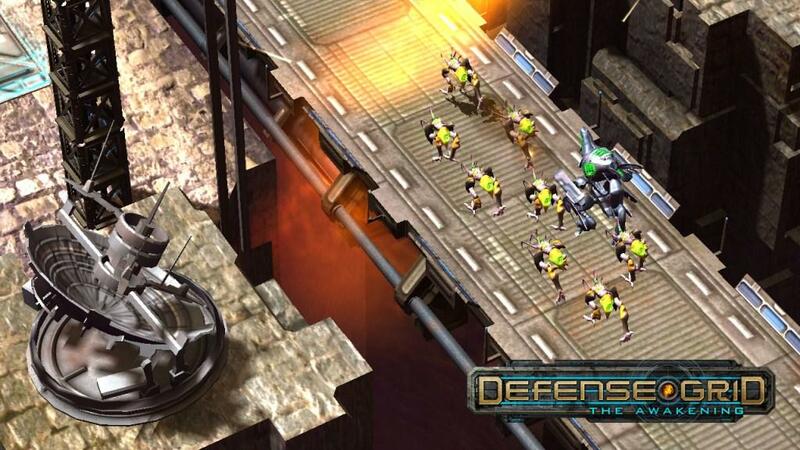 Defense Grid: The Awakening has a simple story that is often used when a game designer wants a generic enemy in their game and having Nazis don’t make any sense. 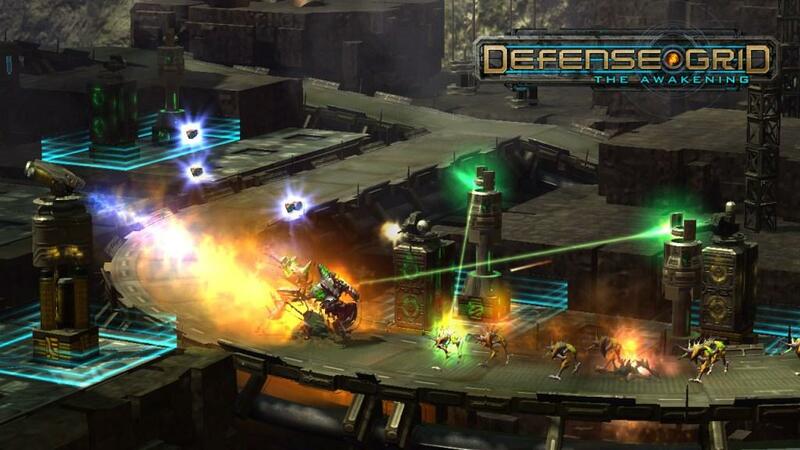 That's right, Defense Grid features an alien invasion. On a far away planet you wake up to find everything in chaos. Cities are abandoned, their defense networks completely disabled, and its up to you to save the power cores which will save the human colonists the inconvenience of have to cook with natural gas. There could be much more explained here it isn’t. Instead of attacking the humans directly why do the aliens try to steal power cores? Are the humans so well protected that only when the power is shut down can the aliens hope to exterminate us form their planet? Why are the humans intelligent enough to create huge weapons to defend themselves but can’t figure out how to keep their power cores in a place that the aliens can’t get to? I could go on and on, and probably could write some fan fiction explaining all of this but all you need to know to play defense grid is aliens bad, big guns good. 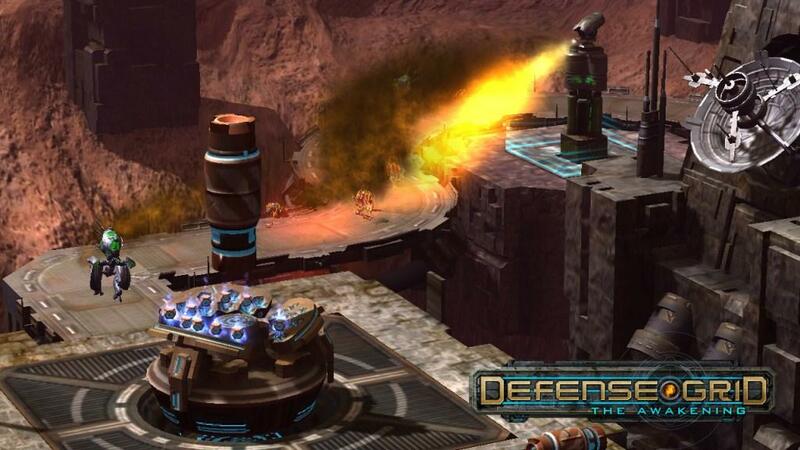 Having evolved from the now standard “turtling” strategy used in everything from RTS to fighting games, Defense Grid’s gameplay is all about building the best defense possible without completely blocking off the path of incoming aliens. If a path is blocked the aliens have no problem completely walking/flying/charging through your weapon emplacements. Most of the time the option of completely blocking a path is not available, the path is laid out and available slots to place weapons do not exist on that path. However later in the game, ore often than not, the path is open and weapon slots are available in a large and open grid. 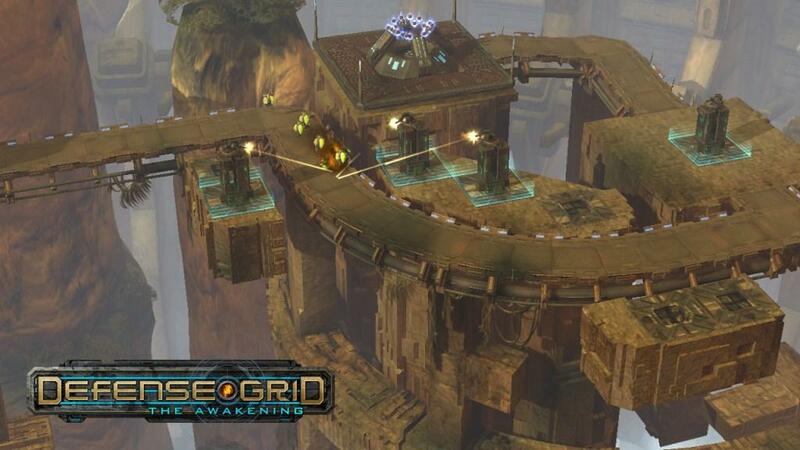 This open grid forces the player to balance the strength of their defenses while constructing weapons in such a way to lengthen the path from the alien’s emergent point to the power cores and then the exit. These levels took me the longest to complete, and I found that simply setting up a straight forward path was the quickest way to a loss. Trial and error was the only way to figure out what the finicky AI of the aliens would allow and what they would by-pass which lead to many frustrations on my part. I would be halfway through a stage and place a weapon in the wrong space at the wrong time and the aliens would start charging through the towers. By the time I realized my mistake it was too late to make a correction. 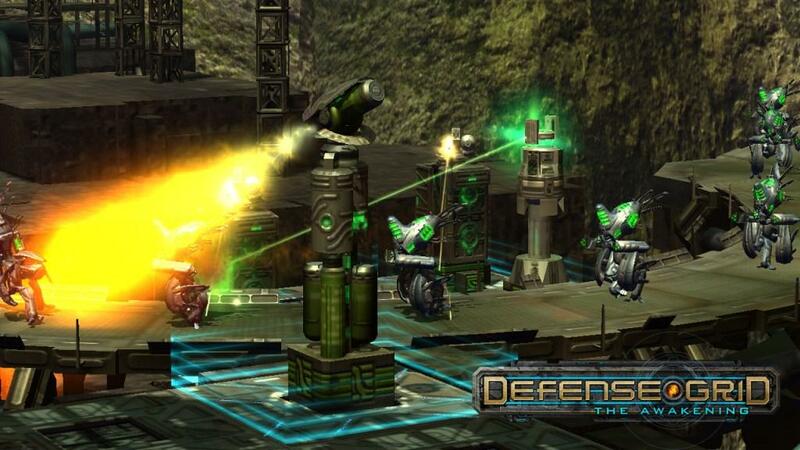 Defense Grid is more forgiving than some of the other tower defense games I have played. When imminent shutdown occurs and a stage is lost there is an option to start from the last check point which occurs at the beginning of each wave of aliens. This is a fantastic feature because it can be difficult to discern which weapon is appropriate for an incoming enemy which are display on the top of the HUD as shapes in different colors continually scrolling from right to left. For instance, when a group of flying enemies approach, ones that completely by-pass the normal land routes, it is a wise move to place missile towers, whose soul purpose is to take down these enemies. During the chaos of a stage I would often forget to install the missile towers and then the flying enemies would swoop in and take the power cores causing my defeat. With the option to start from a check point, I can go back and prepare for the impending aerial assault without having to start the level over. 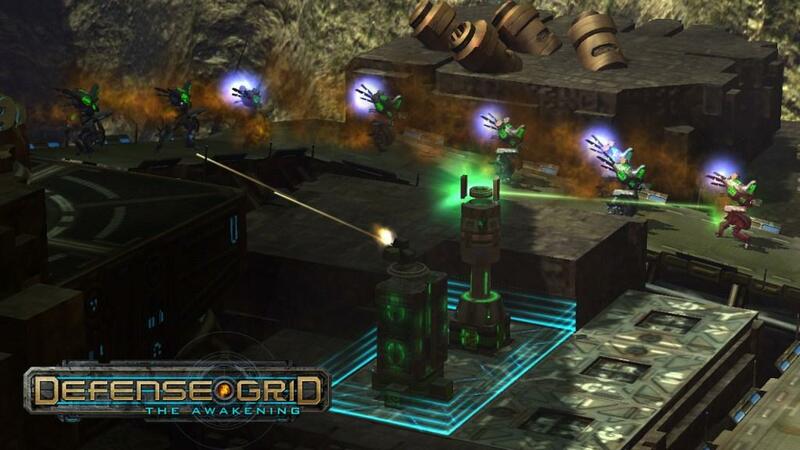 Defense Grid has a simple control scheme using the left analog stick and the A button in a scroll, point, and click manner, leaving the right stick to perform the zoom in and out function. This isn't idea as the right stick could be used in conjunction with the left analog stick to quickly pan around the map and select weapon emplacements quickly. The use of the right bumper (RB) to speed up the pace of the game is a nice feature when your low on cash and just want to get the next wave over with so you can start building again, I would have preferred multiple speeds as an option using booth the left and right bumper to adjust the pace of the game. The only face button that gets use other than the A and B button is X which is used to pull up a detailed status screen showing the shield strength, hull integrity, and carried power cores of the selected enemy. The only time this function gets much use is when “boss” aliens approach that move more slowly but are harder to take down than others. There is a decent mix of enemies that keep you on your toes. Different foes are continuously introduced during the story campaign ranging from the flying aliens to fast moving hordes and even some which cloak, which are usually coupled with a well shielded enemy that soaks up most of the damage while the “invisible” enemies scuttled along. I turned the sound on my television all the way down while playing Defense Grid. Between the only NPC, a computer program that likes to get chatty in the middle of combat, and the endless firing of machine guns there isn’t much time to appreciate the games sound track. The interface and menus functioned well and while there was always a lot going on the HUD never hindered the action. With no multiplayer the summation of online competition can be found in the leader boards. Multiple modes for each stage in the campaign mode and bonus levels which have the same features, attempt to add some life to this title and they do a very good job. All that content definitely adds some value and gives completions more goals to work towards. For me the optional game modes weren’t very attractive, they were either harder (only one power core) or easier (practice mode) and I thought the pacing of the story mode was excellent. Achievement hunters should avoid Defense Grid: The awakening. This is one title that will not give up it’s precious points easily. In the end I have to give Defense Grid props for a better presentation and more content than most tower defense games, definitely making it worth the points. However I can’t put my whole heart behind a recommendation to purchase the game simply because there are probably hundreds of tower defense games online that are free to play. 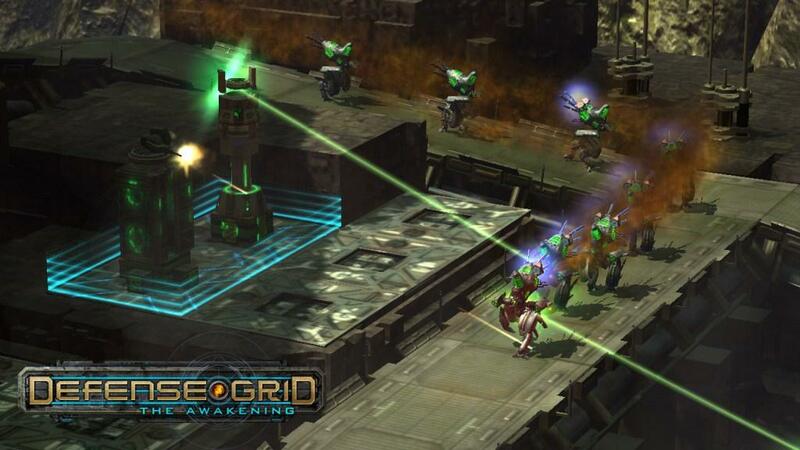 The bottom line is if you do not have a PC or Mac but do have a Xbox 360 and an internet connection then you should consider Defense Grid: The Awakening as your tower defense video game of choice. 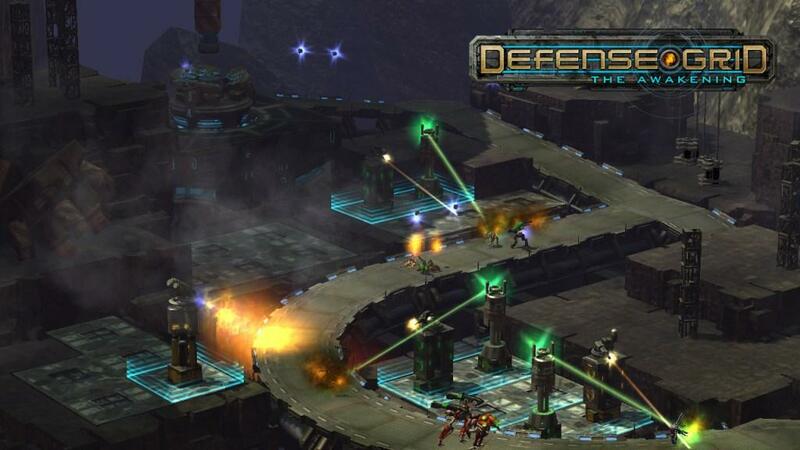 Other wise anyone else with a web browser should look elsewhere for free tower defense fix. With enough content to make it worth the price, but not enough unique content to make it stand out from other free titles you can find online, Defense Grid: The Awakening is a slightly above average tower defense video game.